We mushers all have had a lead dog (or two, or three) that was of exceptional status on our teams. Many stories can be told how these dogs “saved the day”. Many movies and books have been written and shown of these courageous dogs with tremendous will and might. Many dog sledding fans know more about a musher’s lead dog than they do the (human) driver him/herself. The lead dog is often portrayed as the quarterback of the team. The one that all the other dogs listen to. There is one dog that is probably the most widely known lead dog in the world. His name is Balto. There an animated movie about him (pretty good I might add) and he even has a statute in New York’s Central Park. Balto (c.1919-14 March 1933) was a Siberian Husky sled dog who led his team on the final leg of the 1925 serum run to Nome, in which diphtheria antitoxin was transported from Anchorage, Alaska to Nenana, Alaska by train and then to Nome by dog sled to combat an outbreak of the disease. The run is commemorated by the annual Iditarod Trail Sled Dog Race. Balto was named after the Sami explorer Samuel Balto. In January 1925, doctors realized that a potentially deadly diphtheria epidemic was poised to sweep through Nome’s young people. The only serum that could stop the outbreak was in Anchorage, nearly a thousand miles (1,600 km) away. The only aircraft that could quickly deliver the medicine was taken out of winter storage, but its engine was frozen and would not start. After considering all of the alternatives, officials decided to move the medicine by sled dog. The serum was transported by train from Anchorage to Nenana, where the first musher embarked as part of a relay aimed at delivering the needed serum to Nome. More than 20 mushers took part, facing a blizzard with −23 °F temperatures and strong winds. Katie Pryor interviewed the musher after he had finished. News coverage of the race was worldwide. On February 2, 1925, the Norwegian Gunnar Kaasen drove his team, led by Balto, into Nome. The longest and most hazardous stretch of the run was actually covered by another Norwegian, Leonhard Seppala and his dog team, led by Togo. They came from Nome towards the end of the run and picked up the serum from musher Henry Ivanoff. The serum was later passed to Kaasen. Balto proved himself on the Iditarod trail, saving his team in the Topkok River. Balto was also able to stay on the trail in near whiteout conditions; Kaasen stated he could barely see his hand in front of his face. During a blizzard, Kaasen and his team missed the last sled dog team and had to take the medicine twice as far. At Nome, everybody wanted to thank Kaasen at first. He suggested giving fame to Balto as well. Togo was the star dog for Leonhard Seppala even before the great 1925 Serum Run. Instead of celebrating the triumph together as one huge team, many became jealous of the publicity Balto received, especially from President Calvin Coolidge and the press. Seppala favored Togo, but the general public loved the story behind Balto, and so they would take a far different path after the celebrations were over. 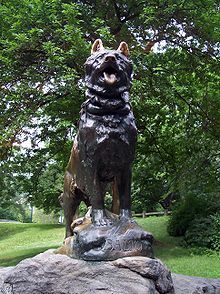 Balto was not welcomed at the ceremony in New York in which Seppala and Togo received awards from the explorer Roald Amundsen.